Tickets for Glastonbury 2013 sold out instantaneously last Sunday leaving those who missed out, sincerely disappointed. Gone are the days when security was relaxed and those without tickets could easily gatecrash the festival. Legend has it someone even managed to dig an underground tunnel to subtly sneak into the festival! Now you no longer need to go to such extremes to get in without a ticket. You can simply work it, and get in for free. 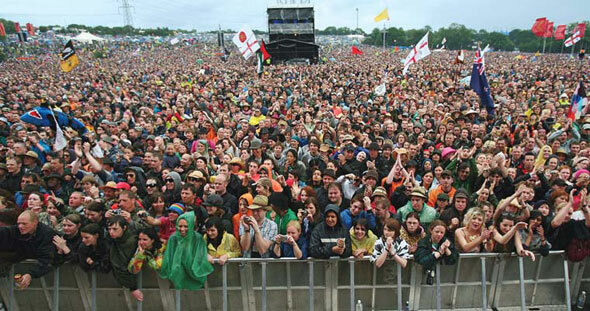 Oxfam organises stewarding every year for Glastonbury and 2013 will be no exception. Along with the security staff, being a steward means you’re the eyes and ears of the festival. Duties of stewards include answering ticket-holders questions, monitoring crowds and reporting safety issues. However stewards are warned against getting involved in the securities responsibilities and failure to listen could result in being stripped of your duty. Stewards are required to work three eight hour shifts and will need to be available for the full onsite dates but once you’re off duty you have access to all of the festival and are free to enjoy it in your own way. Your other perks include meal tickets and camping on the Oxfam campsite with your new friends and hot showers. Becoming an Oxfam steward is easy, no previous experience is necessary as training is required. You’ll be prioritised if you’ve volunteered before but there are always places for new stewards. Just log onto Oxfam’s official websiteand register herefor your chance to work at Glastonbury for free and for a good cause. If you currently hold any medical, paramedic or first aid qualifications you can apply to become an on-site medical volunteer for Festival Medical Services (FMS) at Glastonbury. FMS look to appoint doctors, nurses, paramedics, pharmacists and first aid staff, to name a few. Common injuries and health complaints that occur at Glastonbury tend to be camping gas burns, hearing damage from loudspeakers, stomach bugs from bad hygiene and dehydration, to name a few. Medical volunteers need to keep an open mind as there may be complaints they haven’t dealt with before. During your time off, you’ll get to experience Glastonbury for free, see your favourite bands and even get a chance at meeting and treating Jay-Z for a hangover. If you fancy becoming a volunteer for FMS you’ll need a medical qualification (of any sort) and an up-to-date, cleared CRB check. Insurance and training is covered by FMS. Visit their websiteto register and fill in the application form. Glastonbury has a reputation for being ‘green’. Running the showers on solar power, encouraging festival goers to travel to the festival by bus and planting over 10,000 trees are just some of the ways the festival is helping the planet. Their extensive recycling programme appoints 1,300 litter pickers, 1,200 of them work in exchange for a ticket. The duties are simple; the clean up lasts throughout the duration of the festival and there are even some jobs in the recycling centre which allow you to enjoy the festival and then volunteer once it is finished. This means you get to enjoy every last bit of the music festival without the disruption of work and then carry on the Glastonbury experience by camping for the extra days. What’s even better, Glastonbury founder Michael Eavis often drops by the recycling centre to chat, take pictures and even join in recycling. A campsite is set up for litter pickers to use for you can take advantage of the cheap food and drinks tents, free hot drinks, hot showers and indoor toilets. You don’t need to have any special requirements to become a litter picker at Glastonbury next year, just a dedication to cleaning the fields up. Initially previous volunteers are contacted first but the festival accepts all applications via email. There are a variety of different stalls that run at Glastonbury as soon as the festival kicks off. Whether you are running them or working at them, it’s possible to do either and get a free pass into the festival and better yet, earn some money while you are doing it! If you want to apply to become a trader, applications are open now for all varieties of stalls and traders are chosen depending on the price of their products, the number of staff and size of stall. To sign up to become a trader visit the official signing up list here. If you prefer to serve the drinks and sell the clothes however it’s worth getting in touch with charities such as Greenpeace and Fairtrade who run stalls at the festival and see if they’re after a spare pair of hands. Traders always require staff but they mostly recruit people they know so if you know any traders who go to Glastonbury get in touch with them early on. Stay tuned for tomorrows article giving an insight into the Glastonbury festival experience.